The National Zoo's two Andean bear cubs are no longer nameless! After the public voted on the names, the zoo announced Thursday that the 19-week-old brothers have been named Mayni (MY-nee) and Muniri (moo-NEE-ree). Mayni means "unique" in the Aymara language, while Muniri means "loving" in the Quechua language. The newly named cubs will make their public debut at the zoo this Sunday at 10 a.m., weather permitting. The zoo said Mayni is rambunctious and seems to need their mom's attention a bit more than his brother, while Muniri is playful and likes to wrestle but is more laid back than Mayni. "This is the first time we've had a pair of male cubs, and already we're seeing them wrestle, pounce on and play with each other much more than our previous litters," said zookeeper Karen Abbott recently. "Their interaction with one another and Mom is especially endearing; I think the public will enjoy watching them play and explore their yard." The other name choices for Mayni were Larusiri (lah-roo-SEE-ree) and Kusisqa. The other name choices for Muniri were Tusuq (too-SOOK) and Wayna (WHY-nah). All names on the ballot were culturally significant to two indigenous communities in the Andes region, which is the native habitat of the Andean bear. The cubs were born to 8-year-old Billie Jean over a two-day period last November. Their father is a 21-year-old Andean bear named Cisco. 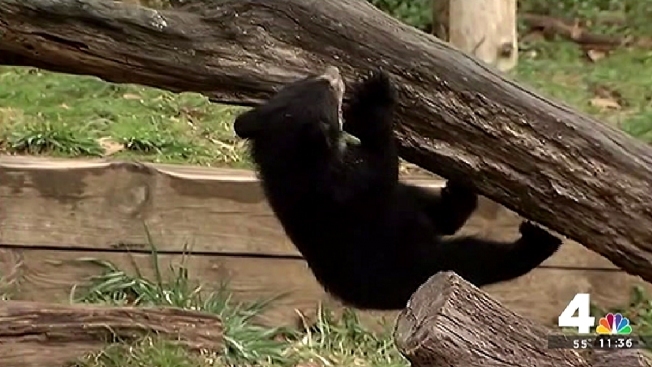 Zookeepers say the brothers have spent the past months bonding with their mother in a den at the Andean bear exhibit. After their birth, keepers monitored the new family via closed-circuit cameras to give them their space, letting Billie Jean quietly nurse and bond with her young.